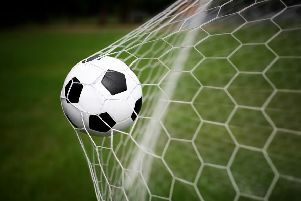 They meet tonight in the RUR Cup final at Lancing, and Pagham and Chichester City had contrasting warm-ups for the big game in their latest run-outs. Pagham confirmed a third place finish in the SCFL premier with a 3-0 win at Hassocks, while Chi City’s heavy home defeat to Haywards Heath meant their visitors were crowned champions. Back in November, Pagham dropped two sloppy home points to Hassocks – but the score was settled at a very chilly Beacon Ground where a couple of unlikely scorers gave the Lions a 3-0 win and guaranteed third place in the table. Starting without their 73-goal partnership of Dan Simmonds and Callum Overton, goalscoring looked to be a problem and so it proved in the first 20 minutes before, from a Lloyd Rowlatt corner, captain Ryan Davidson rose unmarked at the far post to gently nod into the empty net. It wasn’t all Pagham and keeper James Binfield had to be on his toes to grab a 15-yard shot by Robins No9 Michael Death. George Bingham picked up a booking for a poor tackle, but the Lions kept sweeping forward in search of a second. For the second time in the game, Ryan Cox tried his luck from 40 yards to try to catch the goalie off his line, just missing the top of the bar. A fracas at Hassocks’ end of the pitch eight minutes before half-time led to a booking for Pagham’s James Thurgar and Hassocks captain Jordan Badger. In the 45th minute, lightning struck again as Davidson rose unmarked once again to nod in his second of the game and fourth of the season, from a Rowlatt free-kick. The second half started like the first with almost non-stop Pagham pressure and Johan van Driel was unlucky to see a header fly just wide. Van Driel and Thurgar were both in action in the next few minutes but could not get their shots on target. Overton made his return to the pitch after injury in the 61st minute along with Tom Jefkins to replace Thurgar and Rowlatt and for a brief period the Robins looked to dominate, but again could not really trouble Binfield. Overton had a few half-chances, but his luck was out before a bizarre third goal settled the game. In the 85th minute, Hassocks keeper Stroomberg saved from Overton and pushed the ball behind for a corner. Cox took a low inswinger, and with the defender on the line taking no action, the ball bounced off the keeper’s knee and into the net. Pagham: Binfield, Wiggans, Wollers, Davidson, Booker, Bingham, Cox, van Driel, Thurgar (Overton), Rowlatt (Jefkins), Kilhams. Subs not used: Chick, Horncastle. A win for Haywards Heath at Oaklands Park earned them the title. Not that long ago there were seven or eight teams in with a shout. And Chichester were right in the mix for the title or promotion. Miles Rutherford’s side have been inconsistent in recent weeks, though, winning three and losing three of their past six games. Chi welcomed back Lorenzo Dolcetti and Dave Herbert while Lewis Turnbull replaced Ant Ender in goal. The visitors got just the sort of start they wanted when a smart shot from Alex Laing nestled into the bottom corner beyond the reach of Turnbull. There had been chances at either end before the opener. Dan Hegarty did well to head away a nicely struck free-kick and Kieran Hartley rifled an effort narrowly over the bar from long distance after a good move involving Dolcetti and Scott Jones. Ellis Martin was booked for a nasty tackle on Laing and Turnbull tipped away Callum Saunders’ set-piece diving, acrobatically to his left. Then on 14 minutes Laing drew a foul from Hartley. The Chi full-back was given a yellow card and an incensed assistant manager Graeme Gee was sent from the dugout by referee Ciaran Fidler. City’s Italian midfielder went close before a huge slice of luck helped double Heath’s lead when Ben Pashley cut out a through ball intended for Laing only to inadvertently loop it over Turnbull. Dolcetti dragged one wide on the half-hour and had another attempt blocked by keeper Josh Heyburn four minutes later. Melford Simpson, who had a good duel with Jack Lee all afternoon, got something on a cross in the 39th minute but there wasn’t enough on his header to trouble Turnbull. A super run from Kaleem Haitham opened up things down the right and Hartley fizzed a drive over. Sixty seconds later Hartley was trudging off following a second yellow card and Chi were down to ten men. Saunders wasn’t far away with a free-kick in time added on and then Hegarty somehow managed to divert a cross from Simpson for a corner. This was whipped in by Jamie Weston and Nathan Cooper ghosted in to head the ball powerfully into the back of the net. Simpson missed a couple of golden opportunities just after the restart – the second a free header when Saunders picked him out. Lee then blocked another Heath goal-bound effort. Rutherford brought on Rob Hutchings for Jones and Ryan Peake for Ruben French but the visitors were four on the hour. After a run down the right Joel Daly swept the ball home. Turnbull did well to push a free-kick wide and Max Miller missed a sitter when the ball was squared to him in the box, Pashley heading his effort away. Dolcetti gave the home fans something to cheer with a stunning free-kick with 14 minutes to go. There was still time for half a dozen or so bookings for players from both teams – Hutchings, Lee and Peake for Chi. Turnbull made a great stop to deny Laing a second. Then Miller blasted over after nice play by Kane Louis before Miller atoned for his miss and made it 5-1, slotting the ball past the keeper following a swift counter-attack. Louis wrapped things up with a 90th-minute penalty. To compound the home side’s misfortune Hutchings was sent off after the final whistle. There were celebrations as the visitors were presented the league trophy, while City players and fans were left to contemplate another loss to Haywards Heath, another home defeat, another below par performance, another promotion push, that like last year, petered out at the end of the season. City: Turnbull, Hartley, Lee, Pashley, French (Peake), Martin (Lis), Haitham, Hegarty, Jones (Hutchings), Herbert, Dolcetti.